The impact of directly acting antiviral agent (DAA) regimens on renal function is not well defined and quite controversial. 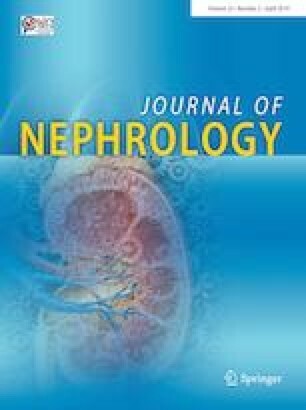 We evaluated the effect of DAAs on kidney function and the factors associated with an improvement or worsening. The changes in estimated glomerular filtration rate (eGFR) in a cohort of 403 patients treated with a DAA regimen were evaluated. The overall sustained virological response (SVR12) rate was 98%. The median eGFR progressively increased throughout treatment from 84.54 ml/min/1.73 m2 (IQR 70.8–97.3) to 88.12 ml/min/1.73 m2. Conversely, rates of patients with a eGFR more than 60 ml/min/1.73 m2 progressively increased from 83.1% at baseline to 87.8% at 12 weeks post-treatment (p < 0.05). Considering the change in eGFR according to the different factors, a significant improvement in eGFR was observed in the patients without diabetes (p < 0.001), in those with cirrhosis (p < 0.05), in those receiving a Sof-based regimen (p < 0.01) or not receiving RBV (p < 0.05), in those with a baseline eGFR less than 60 ml/min/1.73 m2 (p < 0.001) and in those with SVR (p < 0.05). An improvement in eGFR (defined as an increase in baseline eGFR of at least 10 ml/min/1.73 m2) was observed in 148 patients (36.7%). At multivariate analysis, age (aHR 0.96; 95 CI 0.93–0.99, p < 0.01) and a diagnosis of diabetes (aHR 0.02; 95 CI 0.20–0.87, p < 0.05) were inversely and independently associated with improvement in renal function, while the presence of Child–Pugh B cirrhosis at baseline was associated with an improvement in renal function (aHR 3.07; 95 CI 1.49–6.30, p < 0.01). DAAs correlate with an improvement in renal function, underlining the importance of hepatitis C virus eradication to achieve also an improvement in extra-hepatic disorders. The online version of this article ( https://doi.org/10.1007/s40620-019-00608-z) contains supplementary material, which is available to authorized users. NC, IG and FP were responsible for the conception and design of the study and wrote the manuscript; ARB, CC and GB participated in the conception of the study and interpreted the data; LS, GP, SDP, SM, DCA and MP enrolled and followed up the patients; RS interpreted and analyzed the data and performed the statistical analysis. All the authors read and approved the manuscript. This study was supported by a Grant from University of Campania (Grant no. 2017). NC received Grants from ViiV Healthcare, Janssen-Cilag, and Gilead Sciences; personal fees from Gilead Sciences, Abbvie, Bristol-Myers Squibb and Merck Sharp & Dohme IG was consultant for Abbvie, MSD and Cardiome. He received a Grant (in the framework of Fellowship program) from Gilead Sciences. All the authors of the manuscript declare that they have no conflict of interest in connection with this paper. The study was approved by Ethical Committee of University Federico II of Naples (no. 259/2018). All procedures performed in this study were in accordance with the ethical standards of the institutional and/or national research committee and with the 1964 Helsinki declaration and its later amendments or comparable ethical standards.